Shirley E. Mayer, 74, of S Madison Avenue, Port Washington died August 3, 2003 at Columbia St. Mary’s Hospital – Ozaukee Campus in Mequon. She was born March 28, 1929 to Arthur and Theresa Witlgen Mueller in Port Washington, Wisconsin. She was a graduate of Port Washington High School and later worked as a telephone operator and at the Harbor View One Hour Dry Cleaner in Port Washington. Shirley married Robert P. Mayer of Port Washington on February 14, 1953 at St. Mary’s Church in Port Washington. He preceded her in death on January 13, 1982. For forty years she drove bus for the Johnson Bus Company in Port Washington and retired in June of this year. Shirley liked to sew and was a seamstress at her home for others and she also made doll clothes. Shirley and her family were very musical. They were charter members of the former Windjammer Drum & Bugle Corp. in Port Washington. The family all had active roles. She was very proud of her children as they pursued music and education. Shirley had four children, Randy Mayer of Port Washington, Paul Mayer of Milwaukee, Kristine (Scott) Strnad of Saukville and the late Steven “Oscar” Mayer. She is further survived by brother Dennis (Lila) Mueller of Belgium, Sisters Charmain Seyfert of Port Washington and Beverly (Gary) Kinney of Alamo, TX. 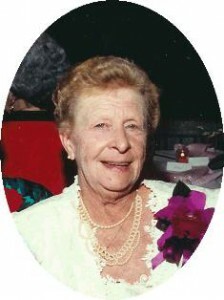 She was a sister-in-law to Angie (Al) Kultgen, Ruth (the late Ambrose) Mayer and David (Ruth) Mayer. She is preceded in death by her husband Robert, son Steven “Oscar”, and sisters-in-law Florence Lauters and Grace Wilsnack. A Mass of Christian Burial will be celebrated at 7:30PM Tuesday at St. Mary’s Catholic Church, Port Washington. The Reverend Allan Sommer will be the celebrant. Interment St. Mary’s Cemetery, Port Washington. Visitation 4 – 7 pm Tuesday at the Poole Funeral Home with a 4 PM Rosary.